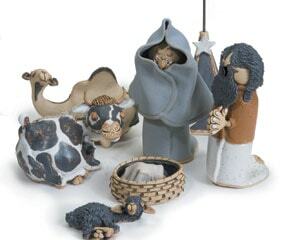 Ever notice how traditional Nativity scenes look so darn solemn? Local artist Tami Bier just may be your Christmas miracle. She’s sculpted a spirited scene of stoneware clay that showcases the star, stable and sweet-faced characters and animals as it was meant to be: a celebration. Bless someone with the whole 18-piece set ($750) or purchase pieces individually. Bier Gallery, Charlevoix, 231-547-2288.